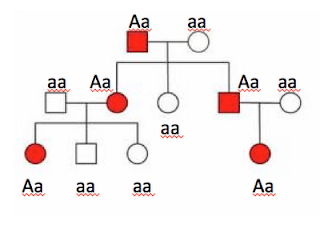 The Mermaid's Tale: Mendelian Inheritance: Basic Genetics or Basic Mistake? Part II. I like the framing here: the point was not to be general, but to demonstrate the possibility of particulate inheritance in some instances (i.e., where the two two---genetic and trait---could be collapsed). But, isn't the idea of particulate inheritance important otherwise? The advantage of digital---the rounding of the analogue---is that not important in its own right, independent of the possible paths of trait inheritance? Here I'd fully agree about the idea of inheritance, but the inheritance is of genomes, not traits, but the two have been subtly and very widely confused in practice, or should I say in 'gestalt'. As we say in this series, the idea of digital inheritance led to one of the most enormously successful research programs in human history. But it has been extended beyond its proper purview, in a sense, when trait and gene inheritance are confused. If I understand what you mean about rounding the analogue, then this has been very useful in, say, pediatrics, where diagnosis of sufficiently disrupted effects leads to treatment. But this was begun before we could find genes or genotype them etc., so I'm not convinced it is a needed or even very useful approach any longer. To me, the problem is having better ways of understanding aggregate genomic inheritance and relating that in scientifically sound ways--not just pragmatic ways--to the nature of aggregate effects. The problem here is that the aggregate is of disparate and heterogeneous causal elements, not the kind of uniform aggregates in, say, the ideal gas law. But again, if your point is the power of the recognition of particulate inheritance, that clearly opened the door, via Morgan and many others, to Beadle & Tatum, Crick & Watson, and so on for 100 years.